A picture is worth a thousand words, and this picture doesn’t say a lot about the integrity of Mayor Michael Bloomberg’s top anti-gun lobbyist. Gun control for thee, but “assault weapons” for me? Michael Bloomberg’s lobbyist Adam Eichberg may hate watermelons, but he seems to love hypocrisy. The Washington Free Beacon tells the story. Read it. One of New York City Mayor Michael Bloomberg’s top gun-control lobbyists in Colorado appears to enjoy firing the very guns he is working to restrict. 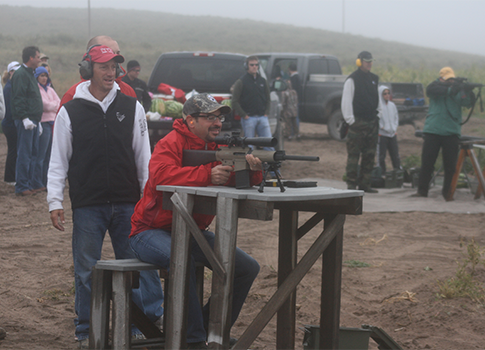 Denver-based Headwaters Strategies lobbyist Adam Eichberg participated at a “watermelon shoot” in September 2012 at the farm of Colorado state Sen. Greg Brophy (R.) where he fired a semi-automatic rifle with a high-capacity magazine. A picture obtained by the Washington Free Beacon shows Eichberg smiling broadly as he shoulders a DPMS .308 rifle with a 20-round magazine. Then wonder… is this just a game for Mr. Eichberg? After the Drudge Report picked up on this story yesterday, it isn’t just Capitol insiders asking themselves that question. A few million of our closest friends have seen the distasteful hypocrisy of the anti-gun movement — guns are fun and safe, but only insiders and political big shots get to use them. Pingback: Colorado Peak Politics - “ARBITRARY AND CAPRICIOUS”: Court Overturn Of Bloomberg Soda Ban To Come Next On Mag Ban? Gallagher, oh my God. Now that would be funny. He had to pull the trigger ever shot. It is not a "machine gun". And shooting watermelons is a lot of fun. Just imagine Gallagher with a.50 Caliber Hammer. A 20-round magazine is now "high capacity?" NOT!